english name "North American Two-spored Destroying Angel"
1. Amanita bisporigera, Vermont, U.S.A.
2. The bright yellow response to 5% (or more concentrated) KOH (potassium hydroxide), Monmouth Co., New Jersey, U.S.A.
3. Amanita bisporigera, New Jersey, U.S.A.
4. 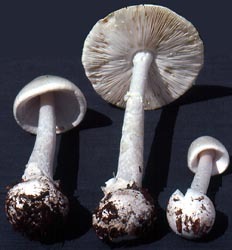 Positive reaction to the Wieland Test indicating the probable presence of amatoxin in a specimen attributed to A. bisporigera, South Carolina, U.S.A.
intro Amanita bisporigera is a mushroom that often contains enough amatoxins to kill an adult human. It extremely important that this species and its look alikes become familiar to anyone planning to collect mushrooms for the table in eastern North America. This is one of the species that will often turn bright yellow in response to a drop of a strong base (like 5-10%KOH) on the cap. Advisory: This page contains a mixture of species that are presently being separated by genetic studies. Of the apparently distinct taxa that have been treated as A. bisporigera, all with the exception of the true A. bisporigera have 4-spored basidia. cap The cap of Amanita bisporigera is 25 - 100 mm wide, white, occasionally slightly straw yellow to pale tannish to pale pink to rose pink over the center especially in age or when sunburned or in hot and dry weather, sometimes slightly rusty in old wounds, convex to plano-convex, at times with a low broad umbo, slightly viscid when moist, with a nonappendiculate and nonstriate margin, decurved at first. 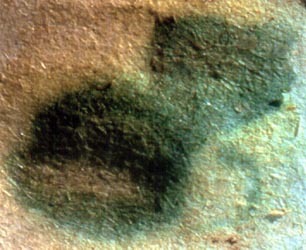 The volva is absent or present as a slight white flocculence on the margin in young fruiting bodies. The flesh is white, unchanging, 5.5 - 6+ mm thick above the stem, thinning evenly for about one-third of the radius (until about 1 mm thick) then thinning more slowly towards the margin. gills The gills are free to barely adnate, crowded, white to off-white in mass, white to barely off-white in side view, unchanging when cut or bruised, 6 - 7.5± mm broad, pointed at both ends to subelliptical, with more tapering toward the stem, with minutely fimbriate (10x lens) white edge, with a sometimes slightly "wavy" edge, and with a decurrent tooth on the top of the stem. The short gills are attenuate to subattenuate to truncate, and numerous. stem The stem is 55 - 140 × 5 - 20 mm, white, narrowing upward, expanded at the top, frequently floccose-fibrillose-squamose, may become smoother with age, and finely longitudinally striate. The bulb is globose to subglobose to irregularly ellipsoid, sometimes subradicating, and 15 - 23 × 13 - 30 mm. The ring is white, superior to subapical, membranous, thin, delicate, skirt-like, very faintly striate above (10x lens), persistent, may become shredded or slip down the stem. The volva is limbate, with 2 or 3 lobes, reaching up to 38 mm from the base of the bulb, about 2 mm thick at the point half way between the attachment to the bulb and the uppermost point of the limb, membranous, white, unstained, becoming appressed to the stem, with no evident internal limb. The flesh is white, unchanging when cut or bruised, solid to firmly stuffed and has whitish or slightly yellowing pith. odor/taste The odor is faintly pleasant at first, but becoming sickeningly sweet in age as in Amanita phalloides (Fr. : Fr.) Link. This species is deadly POISONOUS. spores The spores measure (4.9-) 7.2 - 9.9 (-11.2) × (4.2-) 6.4 - 8.8 (-10.0) µm and are globose to subglobose to broadly ellipsoid, occasionally ellipsoid, very rarely elongate and are amyloid to strongly amyloid. Clamps are absent at bases of basidia. discussion The species was originally described from western New York State (U.S.A.) and appears to have an extensive range from boreal forests on the island of Newfoundland to pine-oak (Pinus-Quercus) forests in Texas. There is a very similar taxon that responds weakly or negatively to KOH solution in southeastern Arizona and central Mexico. 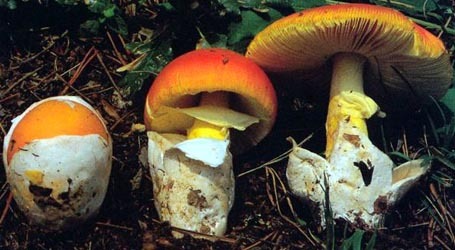 Amanita bisporigera has possibly been exported to pine plantations as far south as Colombia. It is known from the Americas only. Note the yellow reaction to 10% KOH solution on the cap in the background photograph. author G. F. Atk. in C. E. Lewis. 1906. Botanical Gazette 41: 348-352, fig. 74. ≡Amanitina bisporigera (G. F. Atk.) E.-J. Gilbert. 1940. Iconogr. Mycol. (Milan) 27, suppl. (1): 78, tab. 33 (figs. 3-4). =Amanita phalloides var. striatula Peck. 1902. Bull. N. Y. St. Mus. 54: 961. =Venenarius vernellus Murrill. 1945c. Lloydia 7(4): 315. ≡Amanita vernella (Murrill) Murrill. 1945c. Lloydia 7(4):327.
holotypes A. phalloides var. striatula—NYS. V. vernellus—FLAS. lectotypes A. bisporigera—numerous syntypes in CUP. selected illustrations E.-J. Gilbert. 1941. Iconogr. Mycol. (Milan) 27, suppl. : 329, tab. 45. The field may contain magenta text presenting data from a type study and/or revision of other original material cited in the protolog of the present taxon. The following material not directly from the protolog of the present taxon and not cited as the work of another researcher is based upon original research of R. E. Tulloss. Macroscopic descriptions in magenta are a combination of data from the protologs and additional observations made on the exiccata during revision of the cited original material by RET. Advisory: Due to the mixture of 2- and 4-sterigmate taxa prior to the application of molecular tools to the taxa of toxic species of section Phalloideae, this page made reference to data derived from 4-sterigmate material. This data has been removed from all quantitative data fields. There may still be collections reported in the "material examined" data field in olive type that might be removed after further study. We request our user's patience in this matter. tests H2SO4 conc. - negative on pileus surface. KOH soln. (5-10%) - quickly bright yellow on pileus surface. Test vouchers: Halling 7751; Tulloss 7-30-89-H, 7-20-89-P, 7-10-90-B, 8-21-92-B, 8-4-12-U, 8-9-14-H; Vincent 5444.
basidia 31 - 35 × 8.8 - 9.8 μm, in most cases dominantly (always more than 40%) 2-sterigmate, occasionally 1- or 3- sterigmate, never more tha 50% 4-sterigmate, with sterigmata up to 6.0 × 1.5 μm. composite of data from all material revised by RET: [412/18/16] (4.9-) 7.2 - 9.9 (-11.2) × (4.2-) 6.4 - 8.8 (-10.0) µm, (L = (7.8-) 7.9 - 9.2 (-9.6) µm; L’ = 8.4 µm; W = (7.0-) 7.1 - 8.1 (-8.2) µm; W’ = 7.5 µm; Q = (1.0-) 1.02 - 1.25 (-1.70); Q = (1.05-) 1.06 - 1.19 (-1.20); Q’ = 1.12), smooth, thin-walled, hyaline, colorless, amyloid to strongly amyloid, infrequently with small widely and irregularly spaced amyloid warts, globose to subglobose to broadly ellipsoid, occasionally ellipsoid, rarely elongate, often somewhat adaxially flattened, sometimes slightly expanded at one end; apiculus sublateral, truncate-conic to cylindric; contents granular to guttulate; white in deposit. ecology Solitary to gregarious. Florida: In "high hammock" [a relatively limited elevated forested area in the midst of lower, rather wet forest of different composition]. Missouri: At the edge of Quercus-Carya dominated forest New Jersey: In typical Pinus-Quercus barrens of the sandy coastal plain with Acer rubrum, Nyssa sylvatica, P. rigida, Q. alba, Q. marilandica, other Q. spp. with understory including plentiful Vaccinium spp. North Carolina: In dark loam with Acer sp., Ostrya virginiana, and Rhododendron sp. or in leaf mold in woods or in open Castanea dentata woods. material examined from Jenkins' (1978a) type study of A. phalloides var. striatula: U. S. A.: NEW YORK— Warren Co. - Bolton, s.d. C. H. Peck s.n. (holotype of A. phalloides var. striatula, NYS). from type study of A. vernella by Jenkins (1979): U. S. A.: FLORIDA— Alachua Co. - Gainesville, 4.x.1943 W. A. Murrill F 20002 (holotype, FLAS). RET: CANADA: ONTARIO—Norfolk Co. - Port Dover [42.7863° N/ 80.198° W, 182 m], 3.viii.2014 E. Skific s.n. [mushroomobserver #172313] (RET 639-1, nrITS seq'd. ), 23.vii.2014 E. Skific s.n. [mushroomobserver #171045] (RET 632-7, nrITS & nrLSU seq'd.). COSTA RICA: GUANACASTE—ca. Liberia [10°45'53" N/ 85°18'12" W, 750 m], 26.vi.1997 R. E. Halling 7751 (NY). U.S.A.: ARIZONA—Cochise Co. - CMP site #27, 21.viii.1992 W. J. Sundberg s.n. [CMP1347 ; Tulloss 8-21-92-B] (LAM; RET). Graham Co. - Pinallones Mtns., Mt. Graham, 7.ix.1986 J. S. States AEF438 (MICH). FLORIDA—Alachua Co. - Gainesville, 4.x.1943 W. A. Murrill s.n. (holotype of V. vernellus, FLAS F20002). MAINE—Cumberland Co. - Freeport, Hedgehog Mtn., 9.viii.2014 Greg Marley s.n. [Tulloss 8-9-14-H] (RET 628-6, nrITS seq'd.). MICHIGAN—Emmet Co. - Bay View, 22.viii.1905 C. H. Kauffman s.n. [G. F. Atkinson 19707] (CUP-A). MISSOURI—Lincoln Co. - Cuivre River St. Pk. [38.03° N/ 90.93° W, 330 m], 28.vi.2014	P. Harvey s.n. [mushroomobserver #168644] (RET 642-6, nrLSU seq'd.). NEW JERSEY—Burlington Co. - ca. Chatsworth, Franklin Parker Preserve, 12.x.2009 John Burghardt, Felipe Wartchow, R. E. Tulloss [Tulloss 10-12-09-F] (RET 450-6); Wharton St. For., 21.vii.1985 Joe Kuczinski s.n. [Tulloss 7-21-85-B] (RET 204-3). Gloucester Co. - Newfield, s.d. J. B. Ellis 930 (FH as “Agaricus (Amanita) crescendus ined.”). Hunterdon Co. - East Amwell, Sourland Mountains, Rileyville Road, 9.vii.2014 Nina Burghardt s.n. [Tulloss 7-9-14-A] (RET 628-4). Middlesex Co. - Jamesburg Twp., Jamesburg Twp. Pk., ca. Helmetta [40°23’07” N/ 74°25’48” W], 21.ix.1986 R. E. Tulloss 9-21-86-B (RET 468-2), 28.ix.1986 D. C. & R. E. Tulloss 9-28-86-A (RET 467-6), 12.ix.1993 M. A. King, S. E. King Tulloss & R. E. Tulloss 9-12-93-C (RET 104-2), -F (RET 104-3). Morris Co. - Mendham, Meadowoods Mun. Pk., 30.vii.1989 D. C. Tulloss s.n. [Tulloss 7-30-89-H] (RET 247-5), Roger Phillips s.n. [Tulloss 7-30-89-P] (RET 247-6). Ocean Co. - Waretown, Hogenbirk prop. [39°47’12” N/ 74°11’50” W], 9.ix.1993 Cornelius Hogenbirk s.n. (RET 104-6). NEW YORK—Franklin Co. - ca. Paul Smith's, Barnum Brook/Boreal Life Tr. [44°26’57” N/ 74°15’52” W, 504 m], 12.viii.2011 Jean Hopkins s.n. [Tulloss 8-12-11-I] (RET 480-1). Oneida Co. - unkn. loc. 28.viii.2010 Eric Smith s.n. [www.mushroomoberver.org #51543] (RET 481-5). Putnam Co. - Franklin D. Roosevelt St. Pk., 31.vii.1992 R. E. Halling 6880 (NY). Sussex Co. (Long Isl.) - ca. Port Jefferson, 26.viii-2.ix.1904 G. F. Atkinson 20302 (CUP-A). Tompkins Co. - Ithaca, Coy Glen, 23.vii.1917 Leva B. Walker (NEB 30569 as “. phalloides - white form”); Ithaca, Six Mile Crk., ix.1901 C. M. VanHook s.n. [Atkinson 8122] (syntype, CUP-A), 11.viii.1904 C. H. Kauffman s.n. [Atkinson 18504] (proposed lectotype, CUP-A). Warren Co. - Bolton, August C. H. Peck s.n. 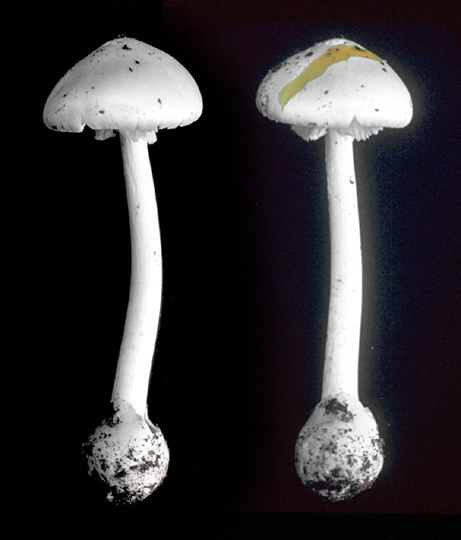 (holotype of Amanita phalloides var. striatula, NYS). NORTH CAROLINA—Macon Co. - ca. Otto, Coweeta Hydrological Stn., 10.vii.1990 R. E. Tulloss 7-10-90-B (RET 025-2). Watauga Co. - Blowing Rock, 19.viii.-19.ix.1899 G. F. Atkinson 3704 (CUP-A). Watauga or Caldwell Co. - 19.viii.-22.ix.1901 G. F. Atkinson 10324 (CUP-A). OHIO—Butler Co. - Oxford Twp., Hueston Woods St. Pk., High Banks, 3.vii.1992 Mary W. & M. A. Vincent 5444 (F n.v.; MU; RET; XAL n.v.). PENNSYLVANIA—Luzerne Co. - Moon Lake Pk. [41.2530° N/ 76.0470° W, 240-400 m], 13.vii.2014 David Wasiliewski s.n. [mushroomobserver #170330] (RET 643-5, nrITS & nrLSU seq'd.). Northampton Co. - Jacobsburg St. Pk., Henry's Wood Tr. & Blue Tr. [40.78277° N/ 75.29265° W, 135 m], 4.viii.2012 A. Pool s.n. [RET 8-4-12-U] (RET 505-7, nrITS seq'd.). TENNESSEE—Sevier Co. - GSMNP, Old Settler's Tr., 11.vii.2006 E. Lickey s.n. [TRB 13269] (TENN); GSMNP, ca. Gatlinburg, Cherokee Orchard [35.6811° N/ 83.4625° W, 945 m], 12.vii.2004 mycoblitz crew s.n. [Tulloss 7-12-04-E] (HKAS 77811, nrITS & nrLSU seq'd. ; RET 377-9). Wilson Co. - Cedars of Lebanon St. Pk., 29.vi.1981 R. E. Tulloss 6-29-81-A1 (RET 170-9), 6-29-81-A3 (RET 115-3), 6-29-81-AZ (RET 114-4), 30.vi.1981 R. E. Tulloss 6-30-81-C (RET 170-8). VERMONT—Bennington Co. - ca. Bennington, Bennington Fish Culture Stn. [42°51'10" N/ 73°10'12" W, 288 m], 24.viii.1980 Mary A. King & R. E. Tulloss 8-24-80-J (RET 392-10). VIRGINIA—Bath Co. - Hot Springs, 23.viii.1918, G. F. Atkinson 25476 [H31-1] (CUP-A). Giles Co. - Salt Pond Mtn., War Spur Ridge, 4.x.1975 S. L. Stephenson 67 (FWVA n.v.). Page Co. - Skyline Drive, S of Big Meadows, 23.viii.1989 E. H. Varney s.n. [Tulloss 8-23-89-EHV] (RET 239-2). WEST VIRGINIA—Greenbrier Co. - Greenbrier St. For., 28.viii.1977 S. L. Stephenson 216 (FWVA n.v.). Pocahontas Co. - Monongahela Nat. For., Droop Mtn., 26.viii.1977 K. H. McKnight s.n. (BPI 14709). Roane Co. - unkn. loc., 20.ix.2001 Bill Roody s.n. (in herb. Roody). Tucker Co. - Fernow Exp. For. 4.ix.1992 S. L. Stephenson, R. P. Bhatt & A. Kumar WS13-114 (FWVA). The above list of collections is likely to be a mixture of collections of five or more probably distinct taxa. Only one of these taxa has plentiful 2-sterigmate basidia on its lamellae—this is the true A. bisporigera. In general, as observed to RET once by Dr. Alexander Smith, the latter species produces basidiomes that are smaller and more gracile than those of other "white destroying angels" of North America. (3) Two robust taxa with 4-sterigmate basidia and globose to subglobose spores: A. amerivirosa and A. sturgeonii. (4) A rather small species with 4-sterigmate basidia—A. sp-bisporigera05. Sporograph comparisons for this group of taxa follow. Note that as this page is corrected, figures that follow will change. The comparisons were first provided 11 September 2014. Additional comparisons of sporographs for white taxa of sect. Phalloideae having a yellow reaction to spot testing with KOH can be found on the technical tabs of the taxon pages for A. exitialis and A. subjunquillea var. alba. Because the results of the following spore measurements imply the spores of A. bisporigera (1) are improbably spherical and (2) do not match more current measurements of spores made using the same (type) materials, the following sets of spore measurements are not included above with the data that generates sporographs representing the present taxon. from type study of A. phalloides var. striatula by Jenkins (1978a): [-/-/1] 7.8 - 10.2 × 7.0 - 10.2 μm, (Q = 1.0 - 1.10; Q' = 1.04), hyaline, thin-walled, amyloid, globose to subglobose; apiculus sublateral, cylindric; contents guttulate; color in deposit not recorded. 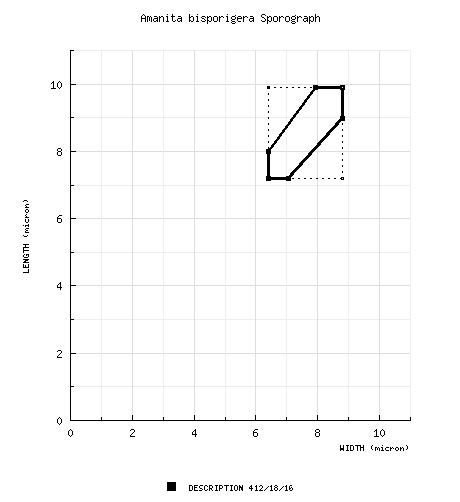 from type study of A. vernella by Jenkins (1979): [-/-/1] 7.0 - 7.8 (-9.7) × 7.0 - 7.8 (-9.4) μm, (Q = 1.0 - 1.03; Q' = 1.01), hyaline, thin-walled, amyloid, globose; apiculus sublateral, cylindric; contents guttulate; color in deposit not recorded. U.S.A.: NEW JERSEY—Burlington Co. - Wharton St. For., 21.vii.1985 Joe Kuczinski s.n. [Tulloss 7-21-85-A] (RET 202-6). Middlesex Co. - Cheesequake St. Pk. [40°26'32" N/ 74°16'10" W, 0-13 m], 10.ix.1989 NJMA foray participant s.n. [Tulloss 9-10-89-NJMA2] (RET 238-10); Jamesburg Twp., Jamesburg Twp. Pk., ca. Helmetta [40°23’07” N/ 74°25’48” W], 28.ix.1985 David C. & R. E. Tulloss 9-28-85-A (RET 101-6), -E (RET 100-2), 30.viii.1987 D. C. & R. E. Tulloss 8-30-87-G (RET 018-2), -K (RET 018-1). TEXAS—Hardin Co. - Big Thicket Nat. Preserve, Lance Rosier Unit, 25.x.1986 Newt Foster s.n. [Tulloss 10-25-86-J] (RET 467-1). The above collections have 4-sterigmate basidia dominant. 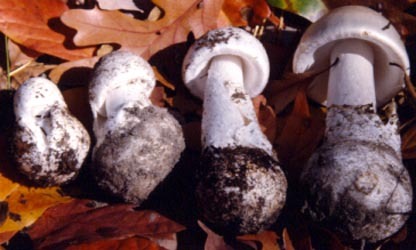 The spore measurements suggest A. suballiacea, and should be done over. Collections probably to be excluded: ?? photo RET - (1) Monmouth Co., New Jersey, U.S.A.
drawing double click in markup mode to edit. watercolor double click in markup mode to edit. provisionally identified as: Amanita bisporigera G. F. Atk. select a collection to review/add spore measurements..#702283. A. Pool, #s.n.=>RET 8-4-12-U, U.S.A., PENNSYLVANIA, Northampton Co., Ja..#713844. J. Yarze, #s.n.=>Tulloss "A" & "B", U.S.A., NEW YORK, Warren Co., Queen..#713908. NJMA foray participant s.n., #s.n.=>Tulloss 9-10-89-NJMA2, U.S.A., NEW ..#713909. David C. & R. E. Tulloss, #9-28-85-A, U.S.A., NEW JERSEY, Middlesex Co...#713910. David C. & R. E. Tulloss, #9-28-85-E, U.S.A., NEW JERSEY, Middlesex Co...#713911. R. E. Tulloss, #9-21-86-B, U.S.A., NEW JERSEY, Middlesex Co., Jamesburg..#713912. D. C. & R. E. Tulloss, #9-28-86-A, U.S.A., NEW JERSEY, Middlesex Co., J..#713913. D. C. & R. E. Tulloss, #8-30-87-G, U.S.A., NEW JERSEY, Middlesex Co., J..#713914. D. C. & R. E. Tulloss, #8-30-87-K, U.S.A., NEW JERSEY, Middlesex Co., J..#713915. M. A. King, S. E. King Tulloss & R. E. Tulloss, #9-12-93-C, U.S.A., NEW..#713916. M. A. King, S. E. King Tulloss & R. E. Tulloss, #9-12-93-F, U.S.A., NEW..#713917. Cornelius Hogenbirk, #s.n., U.S.A., NEW JERSEY, Ocean Co., Waretown, Ho..#714039. John Burghardt, Felipe Wartchow, R. E. Tulloss, #s.n.=>Tulloss 10-12-09..#714040. Joe Kuczinski, #s.n.=>Tulloss 7-21-85-A, U.S.A., NEW JERSEY, Burlington..#714041. Joe Kuczinski, #s.n.=>Tulloss 7-21-85-B, U.S.A., NEW JERSEY, Burlington..#714089. David C. & R. E. Tulloss, #9-28-85-A, U.S.A., NEW JERSEY, Middlesex Co...#714090. David C. & R. E. Tulloss, #9-28-85-E, U.S.A., NEW JERSEY, Middlesex Co...#714091. R. E. Tulloss, #9-21-86-B, U.S.A., NEW JERSEY, Middlesex Co., Jamesburg..#714092. D. C. & R. E. Tulloss, #9-28-86-A, U.S.A., NEW JERSEY, Middlesex Co., J..#714093. D. C. & R. E. Tulloss, #8-30-87-G, U.S.A., NEW JERSEY, Middlesex Co., J..#714094. D. C. & R. E. Tulloss, #8-30-87-K, U.S.A., NEW JERSEY, Middlesex Co., J..#714095. M. A. King, S. E. King Tulloss & R. E. Tulloss, #9-12-93-C, U.S.A., NEW..#714096. M. A. King, S. E. King Tulloss & R. E. Tulloss, #9-12-93-F, U.S.A., NEW..#714195. R. E. Tulloss, #7-10-90-B, U.S.A., NORTH CAROLINA, Macon Co., ca. Otto,..#714244. Mary W. & M. A. Vincent, #5444, U.S.A., OHIO, Butler Co., Oxford Townsh..#714286. C. H. Peck, #s.n., U.S.A., NEW YORK, Warren Co., Bolton, August#714309. W. J. Sundberg, #s.n.=>CMP1347 => Tulloss 8-21-92-B, U.S.A., ARIZONA, C..#714573. mycoblitz crew, #s.n.=>Tulloss 7-12-04-E, U.S.A., TENNESSEE, Sevier Co...#714613. C. H. Peck, #s.n., U.S.A., NEW YORK, Warren Co., Bolton, August#714701. mycoblitz crew, #s.n.=>Tulloss 7-12-04-E, U.S.A., TENNESSEE, Sevier Co...#720189. NJMA foray participant s.n., #s.n.=>Tulloss 9-10-89-NJMA2, U.S.A., NEW ..#720282. David C. & R. E. Tulloss, #9-28-85-A, U.S.A., NEW JERSEY, Middlesex Co...#720283. David C. & R. E. Tulloss, #9-28-85-E, U.S.A., NEW JERSEY, Middlesex Co...#720284. R. E. Tulloss, #9-21-86-B, U.S.A., NEW JERSEY, Middlesex Co., Jamesburg..#720285. D. C. & R. E. Tulloss, #9-28-86-A, U.S.A., NEW JERSEY, Middlesex Co., J..#720286. D. C. & R. E. Tulloss, #8-30-87-G, U.S.A., NEW JERSEY, Middlesex Co., J..#720287. D. C. & R. E. Tulloss, #8-30-87-K, U.S.A., NEW JERSEY, Middlesex Co., J..#720288. M. A. King, S. E. King Tulloss & R. E. Tulloss, #9-12-93-C, U.S.A., NEW..#720289. M. A. King, S. E. King Tulloss & R. E. Tulloss, #9-12-93-F, U.S.A., NEW..#720457. Joe Kuczinski, #s.n.=>Tulloss 7-21-85-A, U.S.A., NEW JERSEY, Burlington..#720458. Joe Kuczinski, #s.n.=>Tulloss 7-21-85-B, U.S.A., NEW JERSEY, Burlington..#720947. J. B. Ellis, #930, U.S.A., NEW JERSEY, Gloucester Co., Newfield#721170. D. C. Tulloss, #s.n.=>Tulloss 7-30-89-H, U.S.A., NEW JERSEY, Morris Co...#721437. David C. & R. E. Tulloss, #9-28-85-A, U.S.A., NEW JERSEY, Middlesex Co...#721438. David C. & R. E. Tulloss, #9-28-85-E, U.S.A., NEW JERSEY, Middlesex Co...#721439. R. E. Tulloss, #9-21-86-B, U.S.A., NEW JERSEY, Middlesex Co., Jamesburg..#721440. D. C. & R. E. Tulloss, #9-28-86-A, U.S.A., NEW JERSEY, Middlesex Co., J..#721441. M. A. King, S. E. King Tulloss & R. E. Tulloss, #9-12-93-C, U.S.A., NEW..#721442. M. A. King, S. E. King Tulloss & R. E. Tulloss, #9-12-93-F, U.S.A., NEW..#721547. R. E. Tulloss, #6-29-81-A1, U.S.A., TENNESSEE, Wilson Co., Cedars of Le..#721548. R. E. Tulloss, #6-29-81-A3, U.S.A., TENNESSEE, Wilson Co., Cedars of Le..#721549. R. E. Tulloss, #6-29-81-AZ, U.S.A., TENNESSEE, Wilson Co., Cedars of Le..#721550. R. E. Tulloss, #6-30-81-C, U.S.A., TENNESSEE, Wilson Co., Cedars of Leb..#721551. Newt Foster, #s.n.=>Tulloss 10-25-86-J, U.S.A., TEXAS, Hardin Co., Big ..#743936. Greg Marley, #s.n.=>Tulloss 8-9-14-H, U.S.A., MAINE, Cumberland Co., Fr..#753068. C. H. Kauffman, #s.n.=>G. F. Atkinson 19707, U.S.A., MICHIGAN, Emmet Co..#754246. Harvey, #s.n.=>mushroomobserver # 168644#754284. R. E. Halling, #7751, COSTA RICA, GUANACASTE, ca. Liberia#755008. A. Pool, #s.n.=>RET 8-4-12-U, U.S.A., PENNSYLVANIA, Northampton Co., Ja..#755009. E. Lickey, #s.n.=>TRB 13269, U.S.A., TENNESSEE, Sevier Co., Great Smoky..#755010. mycoblitz crew, #s.n.=>Tulloss 7-12-04-E, U.S.A., TENNESSEE, Sevier Co...#755504. C. H. Peck, #s.n., U.S.A., NEW YORK, Warren Co., Bolton#755505. W. A. Murrill, #F 20002, U.S.A., FLORIDA, Alachua Co., Gainesville#755626. David Wasiliewski, #s.n.=>mushroomobserver # 170330#755726. E. Lickey, #s.n.=>TRB 13269, U.S.A., TENNESSEE, Sevier Co., Great Smoky..#755727. mycoblitz crew, #s.n.=>Tulloss 7-12-04-E, U.S.A., TENNESSEE, Sevier Co...#755728. R. E. Tulloss, #6-29-81-A1, U.S.A., TENNESSEE, Wilson Co., Cedars of Le..#755729. R. E. Tulloss, #6-29-81-A3, U.S.A., TENNESSEE, Wilson Co., Cedars of Le..#755730. R. E. Tulloss, #6-29-81-AZ, U.S.A., TENNESSEE, Wilson Co., Cedars of Le..#755731. R. E. Tulloss, #6-30-81-C, U.S.A., TENNESSEE, Wilson Co., Cedars of Leb..#788578. E. Skific, #s.n.=>mushroomobserver # 172313#791918. E. Skific, #s.n.=>mushroomobserver # 172313#791919. E. Skific s.n. , #s.n.=>mushroomobserver # 172313mushroomobserver..#792064. E. Skific, #s.n.=>mushroomobserver # 172313#792065. E. Skific s.n. , #s.n.=>mushroomobserver # 172313mushroomobserver..#792067. W. J. Sundberg, #s.n.=>CMP1347 => Tulloss 8-21-92-B, U.S.A., ARIZONA, C..#792068. J. S. States, #AEF438, U.S.A., ARIZONA, Graham Co., Pinallones Mountain..#792069. W. A. Murrill, #s.n., U.S.A., FLORIDA, Alachua Co., Gainesville#792070. Greg Marley, #s.n.=>Tulloss 8-9-14-H, U.S.A., MAINE, Cumberland Co., Fr..#805796. John Burghardt, Felipe Wartchow, R. E. Tulloss, #s.n.=>Tulloss 10-12-09..#805797. Joe Kuczinski, #s.n.=>Tulloss 7-21-85-B, U.S.A., NEW JERSEY, Burlington..#805798. J. B. Ellis, #930, U.S.A., NEW JERSEY, Gloucester Co., Newfield#805799. R. E. Tulloss, #9-21-86-B, U.S.A., NEW JERSEY, Middlesex Co., Jamesburg..#805800. D. C. & R. E. Tulloss, #9-28-86-A, U.S.A., NEW JERSEY, Middlesex Co., J..#805801. M. A. King, S. E. King Tulloss & R. E. Tulloss, #9-12-93-C, U.S.A., NEW..#805802. M. A. King, S. E. King Tulloss & R. E. Tulloss, #9-12-93-F, U.S.A., NEW..#805803. D. C. Tulloss, #s.n.=>Tulloss 7-30-89-H, U.S.A., NEW JERSEY, Morris Co...#805804. Roger Phillips, #s.n.=>Tulloss 7-30-89-P, U.S.A., NEW JERSEY, Morris Co..#805805. Cornelius Hogenbirk, #s.n., U.S.A., NEW JERSEY, Ocean Co., Waretown, Ho..#805806. Jean Hopkins, #s.n.=>Tulloss 8-12-11-I, U.S.A., NEW YORK, Franklin Co.,..#809423. E. Skific, #s.n.=>mushroomobserver # 172313#809424. E. Skific s.n. , #s.n.=>mushroomobserver # 172313mushroomobserver..#809425. R. E. Halling, #7751, COSTA RICA, GUANACASTE, ca. Liberia #809431. Harvey, #s.n.=>mushroomobserver # 168644#809436. R. E. Tulloss, #9-21-86-B, U.S.A., NEW JERSEY, Middlesex Co., Jamesbu..#809437. D. C. & R. E. Tulloss, #9-28-86-A, U.S.A., NEW JERSEY, Middlesex Co., ..#809438. M. A. King, S. E. King Tulloss & R. E. Tulloss, #9-12-93-C, U.S.A., NE..#809439. -F , #9-12-93-C, U.S.A., NEW JERSEY, Middlesex Co., Jamesburg Townshi..#809442. Cornelius Hogenbirk, #s.n., U.S.A., NEW JERSEY, Ocean Co., Waretown, H..#809443. Jean Hopkins, #s.n.=>Tulloss 8-12-11-I, U.S.A., NEW YORK, Franklin Coun..#809453. David Wasiliewski, #s.n.=>mushroomobserver # 170330#809454. A. Pool, #s.n.=>RET 8-4-12-U, U.S.A., PENNSYLVANIA, Northampton Co., ..#809456. mycoblitz crew s.n. , #s.n.=>Tulloss 7-12-04-E, U.S.A., TENNESSEE, Sev..#809461. Mary A. King & R. E. Tulloss, #8-24-80-J, U.S.A., VERMONT, Bennington C..#830562. C. H. Peck, #s.n., U.S.A., NEW YORK, Warren Co., Bolton#830563. W. A. Murrill, #F 20002, U.S.A., FLORIDA, Alachua Co., Gainesville#830564. E. Skific, #s.n.=>mushroomobserver # 172313#830565. E. Skific s.n. , #s.n.=>mushroomobserver # 172313mushroomobserver..#830566. R. E. Halling, #7751, COSTA RICA, GUANACASTE, ca. Liberia #830567. W. J. Sundberg, #s.n.=>CMP1347 => Tulloss 8-21-92-B, U.S.A., ARIZONA, ..#830568. J. S. States AEF438 , #s.n., U.S.A., ARIZONA, Graham Co., Pinallones ..#830569. W. A. Murrill, #s.n., U.S.A., FLORIDA, Alachua Co., Gainesville#830570. Greg Marley, #s.n.=>Tulloss 8-9-14-H, U.S.A., MAINE, Cumberland Co., Fr..#830571. C. H. Kauffman, #s.n.=>G. F. Atkinson 19707, U.S.A., MICHIGAN, Emmet C..#830572. Harvey, #s.n.=>mushroomobserver # 168644#830573. John Burghardt, Felipe Wartchow, R. E. Tulloss, #s.n.=>Tulloss 10-12-0..#830574. Joe Kuczinski s.n. , #s.n.=>Tulloss 7-21-85-B, U.S.A., NEW JERSEY, Bur..#830575. J. B. Ellis, # 930, U.S.A., NEW JERSEY, Gloucester Co., Newfield#830576. Nina Burghardt, #s.n.=>Tulloss 7-9-14-A, U.S.A., NEW JERSEY, Hunterdon ..#830577. R. E. Tulloss, #9-21-86-B, U.S.A., NEW JERSEY, Middlesex Co., Jamesbu..#830578. D. C. & R. E. Tulloss, #9-28-86-A, U.S.A., NEW JERSEY, Middlesex Co., ..#830579. M. A. King, S. E. King Tulloss & R. E. Tulloss, #9-12-93-C, U.S.A., NE..#830580. -F , #9-12-93-C, U.S.A., NEW JERSEY, Middlesex Co., Jamesburg Townshi..#830581. D. C. Tulloss, #s.n.=>Tulloss 7-30-89-H, U.S.A., NEW JERSEY, Morris Co...#830582. Roger Phillips, #s.n.=>Tulloss 7-30-89-P, U.S.A., NEW JERSEY, Morris C..#830583. Cornelius Hogenbirk, #s.n., U.S.A., NEW JERSEY, Ocean Co., Waretown, H..#830584. Jean Hopkins, #s.n.=>Tulloss 8-12-11-I, U.S.A., NEW YORK, Franklin Coun..#830585. Eric Smith, #s.n.=>www.mushroomoberver.org # 51543#830586. R. E. Halling, #6880, U.S.A., NEW YORK, Putnam Co., Franklin D. Rooseve..#830587. G. F. Atkinson, #20302, U.S.A., NEW YORK, Sussex Co. (Long Isl. ), ca. P..#830588. Leva B. Walker, #s.n., U.S.A., NEW YORK, Tompkins Co., Ithaca, Coy Glen..#830589. Bolton, August C. H. Peck, #s.n., U.S.A., NEW YORK, Warren..#830590. R. E. Tulloss, #7-10-90-B, U.S.A., NORTH CAROLINA, Macon Co., ca. Otto,..#830591. G. F. Atkinson, #3704, U.S.A., NORTH CAROLINA, Watauga Co., Blowing Roc..#830592. G. F. Atkinson, #10324, U.S.A., NORTH CAROLINA, Watauga or Caldwell Co...#830593. Mary W. & M. A. Vincent, #5444, U.S.A., OHIO, Butler Co., Oxford Townsh..#830594. David Wasiliewski, #s.n.=>mushroomobserver # 170330#830595. A. Pool, #s.n.=>RET 8-4-12-U, U.S.A., PENNSYLVANIA, Northampton Co., ..#830596. E. Lickey s.n. , #s.n.=>TRB 13269, U.S.A., TENNESSEE, Sevier Co., Grea..#830597. mycoblitz crew s.n. , #s.n.=>Tulloss 7-12-04-E, U.S.A., TENNESSEE, Sev..#830598. R. E. Tulloss 6-29-81-A1 , #s.n., U.S.A., TENNESSEE, Wilson Co., Cedar..#830599. R. E. Tulloss 6-29-81-A1 , #6-29-81-A3, U.S.A., TENNESSEE, Wilson Co.,..#830600. 6-29-81-AZ , #6-29-81-A3, U.S.A., TENNESSEE, Wilson Co., Cedars of Leb..#830601. R. E. Tulloss 6-30-81-C , #6-29-81-A3, U.S.A., TENNESSEE, Wilson Co., ..#830602. Mary A. King & R. E. Tulloss, #8-24-80-J, U.S.A., VERMONT, Bennington C..#830603. G. F. Atkinson, #25476=>H31-1, U.S.A., VIRGINIA, Bath Co., Hot Springs#830604. S. L. Stephenson, #67, U.S.A., VIRGINIA, Giles Co., Salt Pond Mountain,..#830605. E. H. Varney, #s.n.=>Tulloss 8-23-89-EHV, U.S.A., VIRGINIA, Page Co., S..#830606. S. L. Stephenson, #216, U.S.A., WEST VIRGINIA, Greenbrier Co., Greenbri..#830607. K. H. McKnight, #s.n., U.S.A., WEST VIRGINIA, Pocahontas Co., Monongahe..#830608. Bill Roody, #s.n., U.S.A., WEST VIRGINIA, Roane Co., unkn. loc.#830609. S. L. Stephenson, R. P. Bhatt & A. Kumar, #WS13-114, U.S.A., WEST VIRGI..